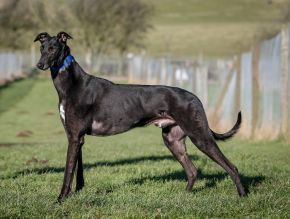 CHARLIE is a gorgeous black male greyhound with a wonderful character. He was a little shy at first whilst he was settling in but he is already showing his super-friendly nature. He loves to say hello when people stop by and he gives a warm waggy-tailed welcome. He tries to speak and paws you to make you come closer. He loves cuddles and enjoys being with humans. He is clean in his kennel and gets on with other hounds especially his kennelmate, Brook. He walks really well on lead and loves to be outdoors. Another love of his is his food which he scoffs with great delight. He will be a truly wonderful addition to your family.